Enjoy a relaxing drive in our air-conditioned bus while learning about our region and its history! Explore ONE gorgeous plantation, stunning gardens and the option to purchase a grand buffet of Southern delights! IT'S A GREAT VALUE- ADMISSION AND TRANSPORTATION INCLUDED! 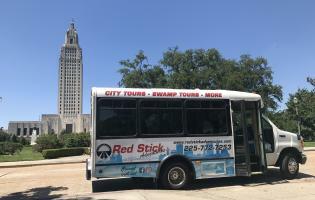 The only tour company in the Baton Rouge region with this package! Tour a stunning plantation home where you’ll catch glimpses into the life of the wealthy Sugar Barons and plantation estates. Feel the triumphs and tragedies of plantation living, as found in the history of these gorgeous grounds and home, as well as the artifacts inside. Explore the luscious gardens, and if time permits, eat at the grand buffet of southern delicacies- (price not included).